Also as I type, it’s absolutely pouring down with rain. I wrote about the dismal weather in my last post. Well today it truly feels like autumn is on the way. The end of summer heralds the arrival of home grown stone fruit such as plums and damsons. 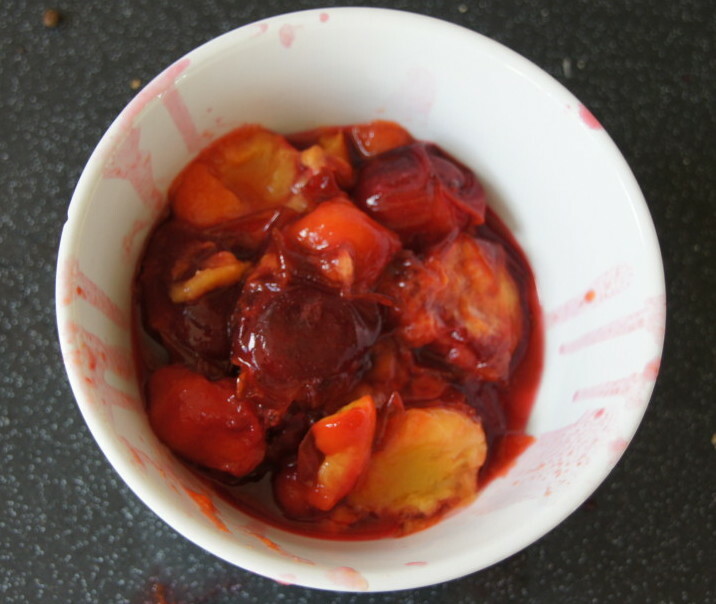 We have a yellow plum tree in our garden which last year I used the fruit from to make yellow plum and vanilla jam. It saddens me that I might not get the chance to bake with them this year as I think we may well be without an oven just as they ripen (if that is at all possible in this hideous weather). Last week I managed to persuade Mr Birdie to leave the house to partake in a Sunday afternoon walk to pick some blackberries. Whilst venturing, we found a damson tree in a local park literally five minutes from our house. We picked a few as they weren’t all ripe and I made a mental note to return. After doing some research online I discovered that there was this Nigel Slater recipe for chocolate damson cake. After a lot of searching online I couldn’t find the recipe anywhere but managed to find out that it was The Kitchen Diaries II. I checked the Hampshire Library Services but it wasn’t in either of my local libraries. I ordered it on the Sunday evening and picked it up the following Saturday for 50p – excellent service! So after another Sunday afternoon walk yesterday to collect some more damsons (about 10 times the actual amount I needed – oops!) I set about making the cake. It is delicious although incredibly rich. Nigel says it will serve 8 however in my opinion I would definitely cut it into smaller slices and serve 10-12 instead. The cake is very squidgy and tastes even better the next day. It would make a lovely dessert served slightly warm with some thick double cream. 1) Put the damsons in a heavy-based saucepan with the water and sugar. Bring to the boil, then lower the heat and simmer, with the occasional stir until the damsons are soft and on the verge of bursting (you might find the skin comes away from the flesh but don’t worry this all adds to the texture of the cake). This will take 10 to 15 minutes. 2) When your damsons are cooked remove them from the heat and allow them to cool. To speed up the process you can tip the cooked damsons into a cold bowl and place this in a bowl or sink half filled with cold water. Give them a stir to allow any heat to escape. 3) When the damsons are cool enough to handle, lift them from the syrup with a slotted/draining spoon into another bowl. Sort through the fruit, removing the stones from the fruit as you go. Make sure you remove all the stones as you don’t want anyone to get a nasty surprise as they eat a slice of cake! Try to remove the stones gently as you don’t want to crush the fruit too much. 4) Grease and line the base of a 22cm square non-stick cake tin with baking parchment (I used a 21cm one and it was fine). Preheat your oven to 180C/Gas 4. 5) Put a heatproof bowl over a pan of simmering water, making sure the base isn’t touching the water, then break the chocolate into it. As the chocolate starts to melt, turn off the heat, but leave the bowl over the water, then add the butter, cut into small pieces. As the butter melts, stir very gently to mix. 6) Meanwhile, separate the eggs, putting the whites and yolks into separate bowls. Add the sugars to the egg yolks and beat until pale and fluffy. Add the melted chocolate and butter, stirring gently but thoroiughly. Carefully add the flour and cocoa powder. 7) Whisk the egg whites until they stand in soft peaks, then fold, using a large metal spoon, into the cake mix, taking care not to over-mix. 8) Scrape the mixture into your cake tin, using a rubber spatula. Spoon in the damsons and gently swirl them through the chocolate mixture with a spoon. 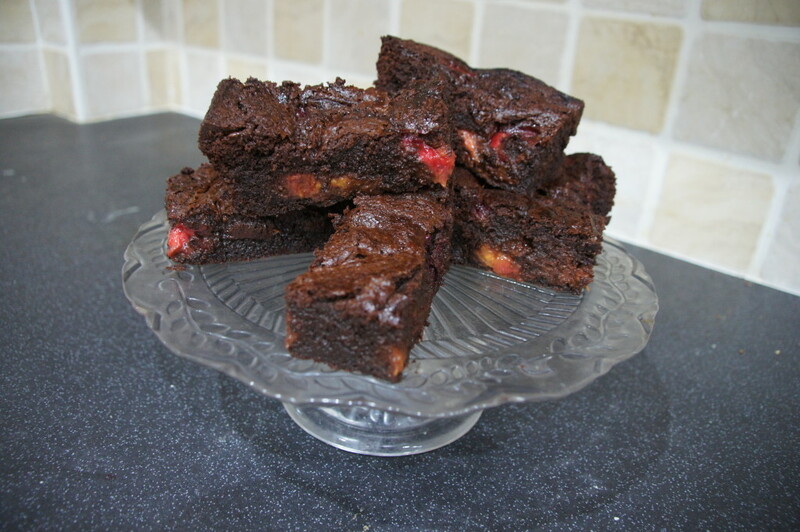 Again, take care not to over-mix, you want ripples of fruit throughout the chocolate mix. 9) Bake for 45-50 minutes (I have mine about 5 minutes extra as it was hard to tell if it was done). You want the middle to be slightly soft and almost mousse like. Remove from the oven and allow to cool completely before removing it from the tin (don’t worry if it sinks in the middle) and cutting into rectangles. Last year I too had been searching and searching the net to find this recipe, and then putting in a library request for Kitchen Diaries II…but since then our local library has been closed down. 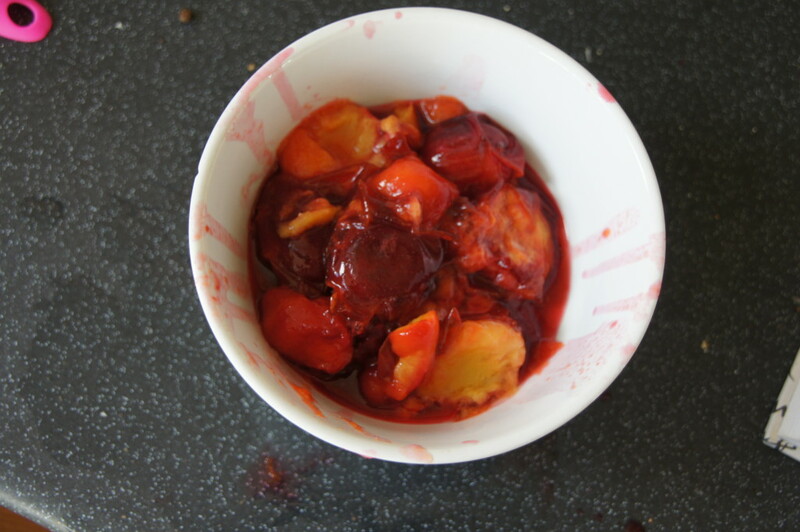 This year, after finding some ripe damsons on our tree, I thought I would just check again on the internet, to see if, in the space of a year, someone had shared the recipe online…and ta da! Thank you so much! So pleased I could help Anna That’s a shame about your library. I went to check our local damson tree a couple of days ago but sadly they had all gone so will have to wait until next year. Happy baking! Mmmm my favourite cake of the year! 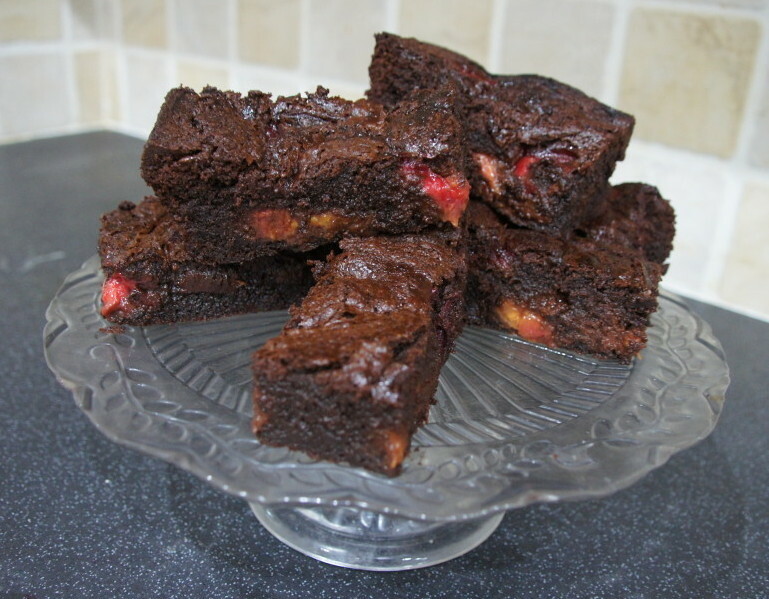 I’ve recently inherited a damson tree on an allotment, so plan to make several quantities of the damsons for this recipe and freeze them in bags to make the cake throughout the year, once a year simply isn’t enough!! Thanks for sharing, my mum has my kitchen diaries book! So pleased you found the post useful. You’re very lucky to have a damson tree – we have one in our local park but I was too late this year as they were all gone (or someone else got there first!) Happy baking! Hi anyone know a recipe for damson fruit cake using damsons and damson brandy like country fare one,it simply is the best fruit cake ever! They won’t give me the recipe,I asked!